HMV has announced a new app for iOS which allows users to take a photo of a CD cover, listen to the content of that CD and then buy it online. Nope, we don't really get why you would want to do this either but you now have the option. HMV has been struggling to find its footing on the high street for some time now, with many an online retailer snapping up its customers with tax-free discounts on physical media. Now it seems that HMV is branching into the app world to entice people back to the company, with its HMV Listening Post app. The listening post is one thing that HMV is renowned for and you can still find the posts in the bigger stores – they are made by TouchVision – but HMV seems to want to give you this feature even when you haven't stepped foot into one of its physical stores for some time. The problem with the app, though, is that you can only buy actual CDs from it – so this isn't the portal to online that you have been waiting for from HMV, just another way to buy their CDs online. "Listen to music previews by taking a photo of a CD cover or searching for an artist," explains the listing on the App Store. 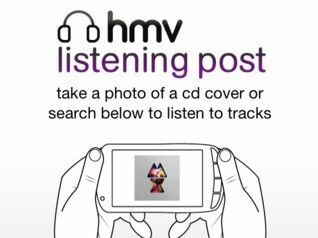 "The HMV listening post recognises albums from a photo or search and enables you to listen to preview clips from the track listing." Besides apps, HMV has been busy creating an online film portal called HMV On-Demand. Currently the service can only be viewed from a computer – we're thinking that maybe it should have focused on making an app for this than offering a glorified link to its online site.